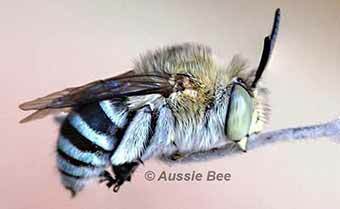 • There are at least 1,700 species of "true blue" Australian native bees (see photos of some common examples below). 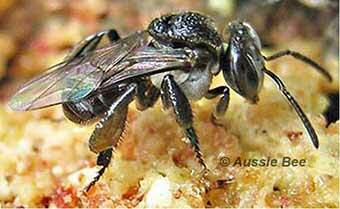 • Australian native bees can be black, yellow, red, metallic green or even black with blue polka dots! They can be fat and furry, or sleek and shiny. • Australia's smallest native bee is Cape York's minute Quasihesma bee (shown in photo above, with Australia's biggest bee). It is less than 2 mm long. 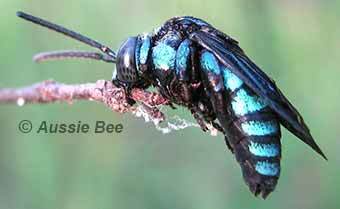 • Australia's largest native bee is the Great Carpenter Bee of the tropical north and northern NSW. It is up to 24 mm long. 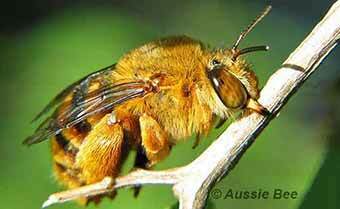 • Most Australian bees are solitary bees which raise their young in burrows in the ground or in tiny hollows in timber. 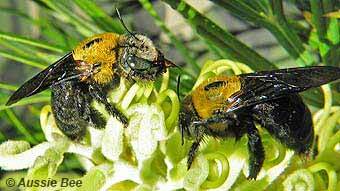 • Australia also has 11 species of social native bees (genera Tetragonula* and Austroplebeia) which do not sting! • Stingless bee honey is a delicious bush food and stingless bees can be good crop pollinators. So stingless beekeeping is becoming increasingly popular. • Native bees are also important pollinators of Australia's unique wildflowers and are a vital part of our Australian bushland. Stingless Social Bee (Tetragonula - previously called Trigona) - 4mm. These tiny native bees nest in large social colonies with hundreds or thousands of bees inside hollow trees. They can be kept in hives and produce delicious tangy honey. Blue Banded Bee (Amegilla) - 11mm. These delightful solitary bees are one of Australia's favourite native bee species. They nest in shallow burrows in the ground. Great Carpenter Bees (Xylocopa) - 24mm. These are the largest native bees in Australia. They nest in soft dead timber. Teddy Bear Bee (Amegilla) - 12mm. These brown furry solitary native bees nest in shallow burrows in the ground. 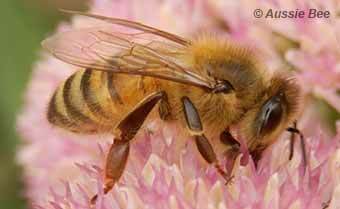 European Honeybee (Apis) - 12mm. This bee plays an important role in honey production and crop pollination throughout Australia. 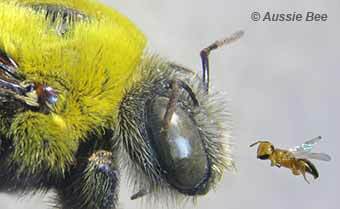 However, feral nests of this bee are also found in most areas of Australia. 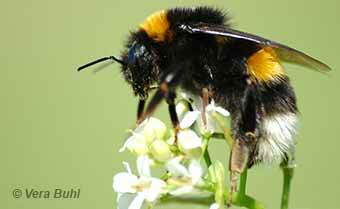 European Bumblebee (Bombus) - 8 to 22 mm. (Photo derived from work by Vera Buhl, CC BY-SA 3.0.) Australia has no native Bumblebees. A feral population of this bee has become established in Tasmania but fortunately it has not spread to the Australian mainland.